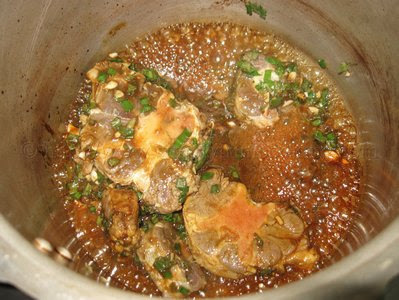 Today, I decided to post the second method of stewing oxtail. This time we’re using the more common method of using sugar to brown the meat. 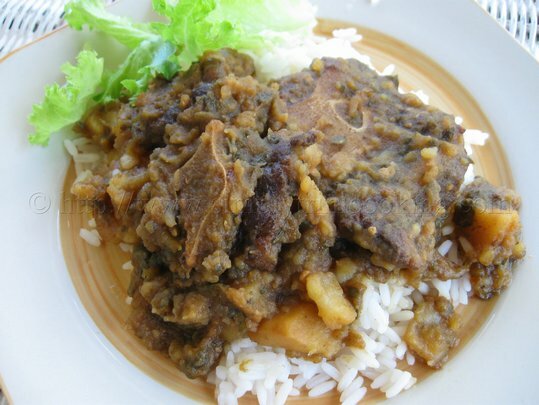 Just like you would stew chicken you could also stew oxtail. 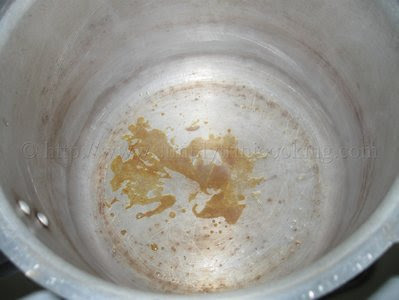 This method gives it a slightly more sweet taste and a more golden look like in the picture. 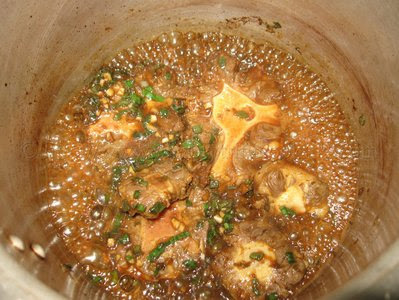 We usually like to stew oxtail together with potatoes most of the time, but it also goes well with baigan (egg plant). 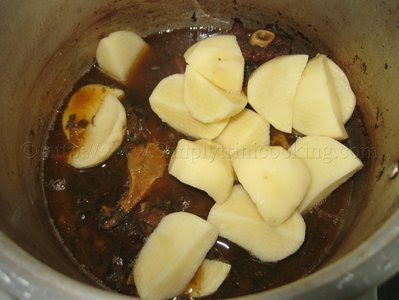 When oxtail is stewed with potato it thickens and makes it a more filling and a complete meal at the same time. 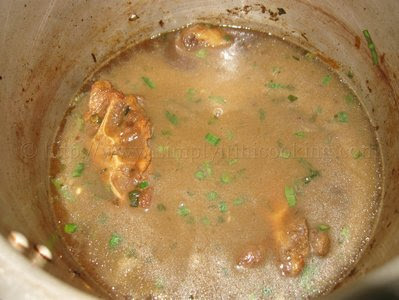 All you have to do is serve it with rice and as we say in Trini “all talk done”. We’ll be using the pressure cooker method because this meat is really tough and only a pressure cooker could tenderize it. And still, after pressure cooking you have to be careful of the bone not bruising your gums. 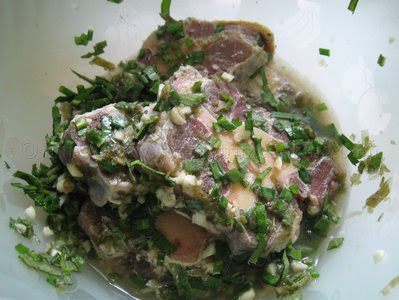 You could apply the curry goat tips to this meat as well. Remember to heft the pressure cooker first to get the original weight then as it cooks shake lightly to feel if there’s water remaining. Still look at the steam from time to time to be double sure. 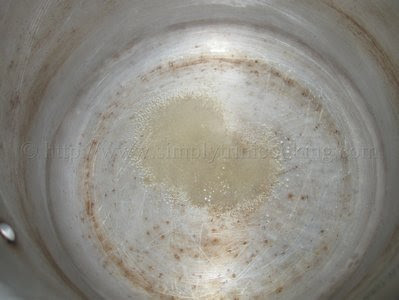 When the sugar has a golden colour, add the oxtail and stir. 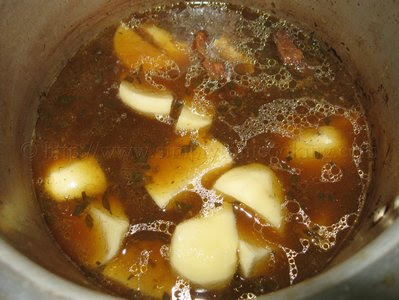 Make sure the oxtail gets evenly coated with the caramelized sugar. 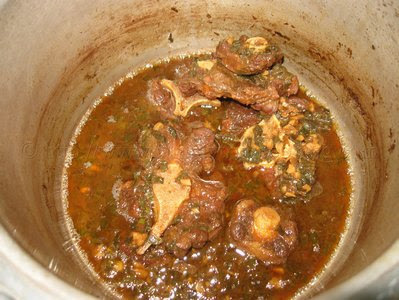 the oxtail is half done after the 15 minutes. 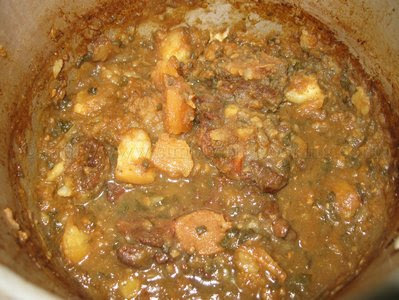 The finished stew oxtail with potato. Serve with rice. Ok! see you later. Ah gone! hi love your site. i have tried a few of your recipes. one question though, why do you cut up your seasoning instead of blending it? I do blend my seasoning. I just cut up mine for this recipe seeing that I had fresh seasoning.